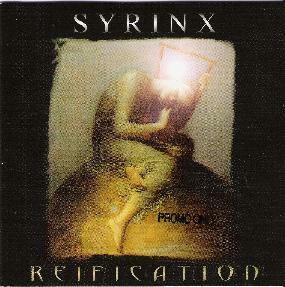 Not to be confused with the Canadian progressive rock group from the 70s led by John Mills-Cockell, this Syrinx (from France) synthesizes an array of contrasting styles into a kaleidoscopic panorama where the dark, muted colors of futuristic chamber rock (the later Art Zoyd and Univers Zero, for instance) merge into a strange but powerful symbiosis with the astral ambiences of such baroque post-new wave progressive iconoclasts as This Mortal Coil and Dead Can Dance. Unlike many other of their progressive brethren, however, Syrinx' approach is somewhat less overbearing, perhaps because the focus here is acoustic guitar instead of the more conventional electric. All of the songs on Reification show a commitment to well-honed craftsmanship and intricate compositional development. "Le Vingtieme Cercle," for instance, features some arresting interplay between classical guitar and flute, as well as some icy synthesizer texturing. It's a haunting piece that recalls King Crimson and Gentle Giant at their most ornate and magisterial. Though at times conceptually overblown-the cosmological treatise expounded upon at length in the liner notes-could only be considered "profound" by a college sophomore-there is much to admire here in the rococo sound architecture of the extended title track and "Orbis Ubique." The latter achieves an almost symphonic rock grandeur in its use of neo-classical song structure and shifting art rock time signatures. Fortunately, there are no pretentious lyrical texts to accompany the often astounding musical gymnastics Syrinx performs throughout Reification. The bravura performances speak for themselves, and quite eloquently, too, I might add. For more information you can visit the Syrinx web site at: http://syrinx.aeon.free.fr.